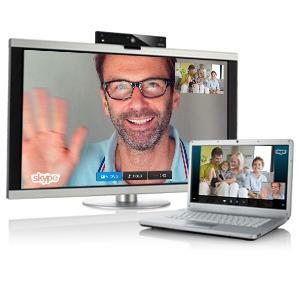 Skype on the Comcast XFINITY service is finally a reality for at least people in a couple of cities. Comcast has been discussing for some time now how it was going to be bringing Skype to its customers, and those of you in Boston and Seattle can start experiencing it as of today. (Atlanta, Augusta, Ga., Chicago, Detroit, Harrisburg, Pa., Indianapolis, Miami and Pittsburgh are expected to be activated by the end of the week.) The new service will run you $9.95 a month, and you'll need a special kit provided by Comcast that includes a camera, a text-enabled remote control for IMing and an adapter. While the idea of being able to Skype from the television in your family room is a nifty one, we're not sure why it takes specialized equipment and an additional fee when certain Samsung television sets are now coming with the service built-in. If this is a must have feature for you, however, $9.95 a month sure beats running out and buying a new TV. "Through our collaboration with Comcast, we are delivering a truly compelling HD calling experience to consumers, and demonstrating Skype's continued leadership in video communications," said Bob Rosin, Head of Business Development for Skype. "Our partnership brings video calling into the heart of the home – the living room – where it enables people to share life's experiences in a whole new way."